In his State of the City address on September 18, 2014, Cincinnati Mayor John Cranley remarked on the advantages of public-private enterprise at Smale Riverfront Park downtown, and its success, and offered a vision for a beer pavilion on the grounds of Westwood Town Hall facing the Westwood Square that is currently being considered. Residents of Westwood who’ve engaged in deliberation about the revitalization of the historic business district know well that (1) places to socialize with neighbors are high on the list of desirables, (2) the Westwood Square will mark our center and encourage people to see what Westwood’s neighborhood business district has to offer, and (3) Town Hall and the businesses and organizations it faces are landmarks and treasures. 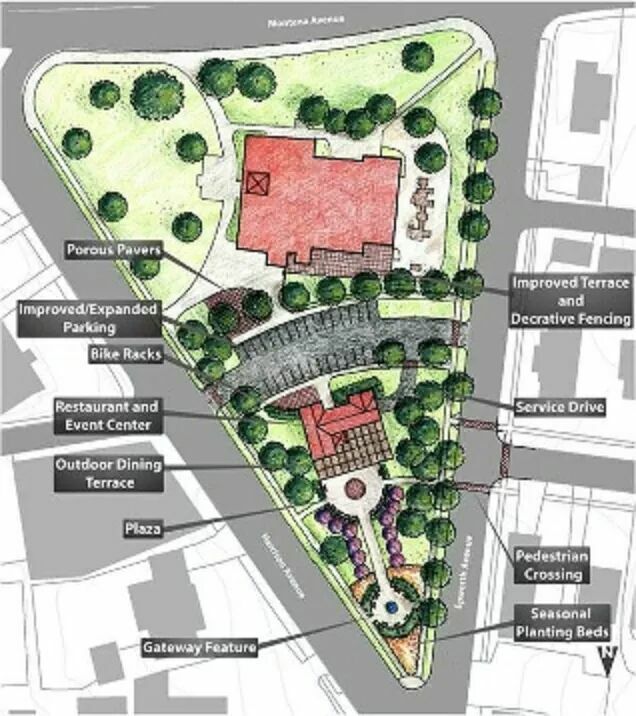 As residents have been discussing in Westwood, we want a plan for the Square that has Harrison-Epworth-Urwiler as its focal point, our Main+Main, and that anchors this area surrounded by neighborhood assets like Town Hall, Madcap Puppets, Henke Winery, and area churches. We want something that is reflective of Westwood’s history and style. The Mayor’s proposal, pictured here, will certainly be explored. Comments? Post here! The Coalition has used its last two steering meetings to invite input from experts familiar with neighborhood revitalization and with development. Guests were asked to comment on the options under consideration for a Westwood Square. They shared perspectives and insights into the economic development opportunities afforded by each option. They also commented more generally on what prospective developers look for in a business district. These discussions, in concert with the comments from residents following each recent community meeting, provide invaluable input into the Westwood Coalition’s decision-making process as it formulates its Westwood Square recommendations over the coming month. Remarks from the Aug 28 2014 meeting are available and will be followed shortly by those of the September 18, 2014 meeting. The speakers emphasized the importance of community engagement and vision, of site control, and of a planning process. Several highlighted the value that the form-based code brings to a neighborhood business district. The Coalition asked them to offer perspective on the revitalization value that each option would bring to the community. Uniformly, Coalition members heard that the successful plan will be Westwood-specific, it will be community-anchored, realistic, and will build on the assets of the community. It will be successful when we find the right mix of public-private support and of local and regional business talent and commitment. The guests underscored the importance of business district as destination with a mix of businesses and programmed activity. They all congratulated the Westwood Coalition on the quality of the planning and input to date and then offered specific remarks on the options. The community can expect the Coalition to make a report and recommendations in late October.